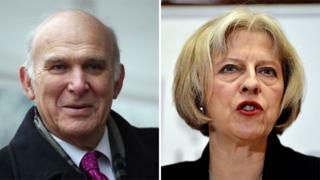 The Tories have accused Vince Cable of trying to water down a ban on "hate preachers" in English universities. The government recently passed laws aimed at banning all "extremist" preachers from campuses. But Lib Dem minister Mr Cable says guidance to be issued to universities should say it only applies to those who directly incite terrorism. Tory chairman Grant Shapps said there was a row over where to draw the line when it came to extremist views. "What we're saying is that if we believe somebody comes into university and they preach extreme hate, if they preach that students should effectively be radicalised, then that is going to far," he told BBC Radio 5's Pienaar's Politics. "We don't have a problem - at all - with free speech with people talking about different belief sets and what motivates and drives people. "But we err on the side of caution because we think that protects the British public. The Liberal Democrats have a more liberal view." Lib Dem climate change minister Ed Davey accused Conservative ministers of "playing to the audience" on the issue and of being "vague" about how the new rules will apply. "If you change that line, that's a dangerous attack on free speech," he told Pienaar's Politics. He said someone who espoused an Islamic caliphate "and said in order to get that you need to kill people" would cross the line. "But saying some people believe in a caliphate, I don't think that's wrong," he added. Under the Counter Terrorism and Security Bill, which became law in February, many public bodies, such as schools, universities and local authorities, have a duty to help prevent people being drawn into terrorism. The government is currently considering the results of a consultation exercise on how the law should be applied and what guidance should be issued to universities and other bodies such as local authorities. The proposed guidance says: "Universities must take seriously their responsibility to exclude those promoting extremist views that support or are conducive to terrorism." But sources close to Mr Cable said the business secretary, who also has responsibility for higher education, thought this was "too prescriptive". "Clearly, there needs to be cases where speakers with extremist views are banned but allowing the debate to go ahead is really important. "The debates are likely to happen even if they are banned from campus. They will find another venue." Banning all extremist preachers risked driving debate underground, making it more difficult to provide strong opposing opinions to "horrific views," the source added. Mr Cable is arguing that only those who directly incite violence should be excluded. But Theresa May has said she expects universities to take a tougher stance following claims Mohammed Emwazi - so-called "Jihadi John" - may have been radicalised at Westminster University in London. The home secretary told The Sunday Times: "If colleges and universities didn't realise before what we are up against, they should know now. "We're not talking about regulating debate - we're saying they need to do more to stop radicalisation on campus." There have been concerns from universities and others, including from the former MI5 chief Baroness Manningham-Buller, that the law risked banning "non-violent extremists" from speaking at universities, which could impact on freedom of speech.